Today’s women lead increasingly busy lives. Even so, it’s important to take time out for routine breast cancer screening, because all women are at risk. 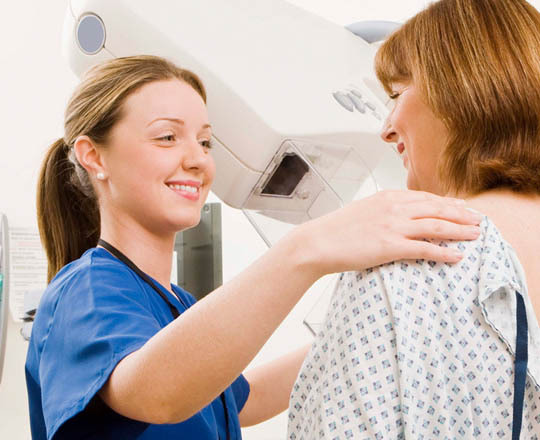 At this facility, St. Luke’s provides screening mammography, 3-D mammography, and education in order to identify cancer at its earliest, most treatable stage. At age 55, women should have mammograms every other year — though women who want to keep having yearly mammograms should be able to do so. Some women are at higher risk for breast cancer and should begin screening earlier. The most important thing is that you talk to your doctor about the screening timeline that’s best for you. Tue - Wed: 8 a.m. - 4:30 p.m.
St. Luke's is the only program in Idaho accredited by the National Accreditation Program for Breast Centers (NAPBC). We keep the highest standards and adhere to the best practices to find what works best for you. St. Luke's Mobile Mammography is Coming to You! No matter where you live, you still may be able to receive your mammogram close to home when our Mobile Mammography Coach rolls into town. The Mammo Coach travels to rural areas in southwest Idaho and eastern Oregon, providing over 2,000 mammograms every year. This broad geographic coverage relieves the time, burden and cost of traveling long distances for care. Call (208) 706-2055 or toll free 1-866-381-2055 for upcoming dates and locations. You may also request an appointment online.